Worked on a new webapp for financial services company. Maintain and improve existing JSF webapps with legacy Seam heritage. Improved performance of those webapps. Consultancy for other developers. LinkPizza is a native monetization platform. Using a single script, it replaces every single link in your website by an affiliate link, earning money per click where possible, without need for annoying advertising banners. I participate in Kizitos J-Development team. I'm co-founder and main front end developer of LinkPizza.com. I have developed nearly the entire public front end from scratch. It is currently using Java EE 7 with JSF 2.2. ZEEF is the new social search engine. Humans are filtering the web and offer the results in categorized lists of links. I participate in Kizitos J-Development team, in 2013 via telecommuting from Curaçao and since 2014 on location in Amsterdam. I'm co-founder and main front end developer of ZEEF.com. I've developed nearly the entire public front end from scratch. It's currently using Java EE 7 with JSF 2.2. M4N offers advertisers, media agencies and website-publishers an effective software application for realising online traffic and sales and managing online affiliate-, marketing- and partnerprograms. I participated via telecommuting from Curaçao in the Kizitos J-Development team, working on the webapplication and backend of Mbuyu - M4N, formerly available at m4n.nl. The main technologies and tools used are JBoss AS, JSF, PrimeFaces, PostgreSQL, Eclipse, Selenium, Mercurial and Trac. I have guided and assisted the migration of a ~50K loc web application from Java EE 5 (JSF 1.2 on JSP and some servlets) to Java EE 6 (JSF 2.1 on Facelets). In the meanwhile I have worked on improving and refactoring their code base and introduced modularization. I have split the web application into two modular parts: the stateless (sessionless) public part which is served by http and the stateful application part which is served by https. I have replaced homegrown JSF table components by PrimeFaces components with slightly customized CSS and renderers. 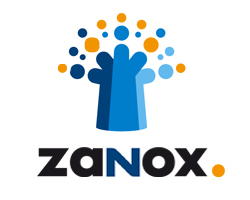 Since the takeover by Zanox, I have developed a lot of UI changes to ease a seamless migration of existing users to the new Zanox platform. ITCA facilitates both software vendors and the users of their software, with services that aim at reducing under- and over-licensing, these services are commonly being referred to as "License compliance" or "License optimization". I was responsible for the architectural, functional and technical design as well as the development and maintenance of the web application which offers a portal of services with the most important part the online self-audit system. The technologies used are Tomcat, JSP/Servlet, PostgreSQL and jQuery, all in the most recent versions. Besides this I have also developed some related websites using PHP/jQuery based on delivered PSD web designs and some related software using Java. AIH Services NV is a small company residing at the e-Zone of Willemstad, Curaçao, Netherlands Antilles. This company has a lot of small business partners who may be in need for a software engineer for various projects. I played a role of an all-round software engineer who is specialized in web development. I can be involved in development of various tastes of (web) applications, such as Java applications, PHP/MySQL web applications and even plain vanilla HTML/CSS/JS webpages. As far I have developed a PHP/MySQL web interface for a mobile phone game which includes a Java batch application in the background to process the game based on a Java based AI, developed a few conceptual websites, modified some existing plain HTML/CSS/JS websites and redesigned and redeveloped an existing PHP/MySQL webshop with layout and performance issues. In the meanwhile I've continued hobbying with Java EE/JSF a lot to keep myself up to date with those technologies. RDC data center is one of the biggest data centers of The Netherlands and is leader in the automotive branche (90% of the market) in the areas of services, communication and information. I was involved in renewal of the application infrastructure of RDC (and inherently also RDW, including their well known vehicle plate search machine). I was hired via Vicksburg IT Power Providers BV. I have developed a variety of web applications which are to be fitted in a SOA infrastructure with web applications, web services, data services and databases. The web applications are written entirely in JSF 1.2 and several custom components are been used. The web services are based on Websphere-autogenerated JavaBean skeletons from WSDLs and are callable by SOAP/XSL. The data services are similar to web services and interact by EJB2/Hibernate with DB2 servers. There were also a bunch of batch Java Applications written which calls the web services and data services using JTA/JOTM. Next to this all I have also developed a high-persistence logging framework which makes use of JMS and MQ series. Tweakers.net BV is one of the biggest Dutch Internet communities. It has a big focus on the ICT professionals and hobby computer enthusiasts. Their website and discussion forum are visited by them daily for more than 2 million times. I have developed a new jobs database for their website. In 3 months I have designed a data model for MySQL and developed a PHP web application where the job seekers can post their CV and search for available vacancies. The employers can post their company’s profile and post several vacancies. There are automatic matches based on a set of predefined input data. From Jan 2001 to Oct 2004 I worked for the HONE/LINK department which grants support to owners of an IBM server. The owners can request, review, change and order hardware and software configurations of their IBM server using several web applications. Those web applications runs at S390 servers with zVM OS and are been programmed in legacy REXX. Those web applications can process XML as well as HTML as input and output. I was responsible for maintenance of those web applications. At Q2 2003 IBM decided to move the front-end of those web applications from REXX to WebSphere/J2EE, while the back-end still remains REXX. The new J2EE front-end would temporarily communicate with the legacy REXX back-end using XML. I was involved in writing JSP’s and a bunch of XSLT’s for the new J2EE front-end. Before leaving the department I have educated and supported three Indian developers who were about to take over my activities. From Oct 2004 to Aug 2005 I worked for the Human Resources department who provides a big intranet web application which maintains personal data of any employee who work(ed) at IBM. The managers can request their personal data, position data, financial data, education data, etcetera. Almost anything of more than 350.000 IBM employees is made available. The web application runs at WebSphere/J2EE. I was involved in the boring task to change the HTML markup and CSS style of the front end from an older IBM layout to a newer IBM layout. Partly I have also changed and added some new JSP/Servlet based functionality to the web application. Furthermore I was also been a Business Analyst in my “free time” and I also wrote a bunch of prototyped HTML pages and use cases and I did lot of system tests. Finished university within time with only self-learning (I am born deaf and didn't make use of a personal translator). For the case one wonders why I didn't do CSI-like lab jobs; during internship in last school year I realized and decided that this wasn't really what I want. Also, at the moment I went into the job market, the dotcom bubble was at its peak and it attracted me more. I also had the benefit that the education was very technical (maths and physics at high degree) and I already have developed some programming skills in private/hobby time since I was 11 years old, starting with C64 Simons Basic. This was for IBM enough to let me in. Java EE Kickoff App is basically a boilerplate project which can be used to kickoff the development of a brand new Java EE web application. I’ve used it for my last three projects. How does the 'binding' attribute work in JSF? When and how should it be used? How to choose the right bean scope? How to populate options of h:selectOneMenu from database? How to include another XHTML in XHTML using JSF 2.0 Facelets? Is it possible to use JSF+Facelets with HTML 4/5? JSTL in JSF2 Facelets... makes sense? In this tutorial you will learn how to setup a JSF 2.0 (Mojarra) playground with Eclipse 3.6 SR1 (Helios) and Oracle Application Server v3 (Glassfish). When we submit a HTML form with empty input fields which are bound to non-primitive bean properties, we'd rather like to keep them null instead of being polluted with empty strings or zeroes. This is very significant as to validation constraints such as @NotNull in Bean Validation and NOT NULL in relational databases. Across years and JSF/EL versions this turned out to be troublesome as not anyone agreed on each other. 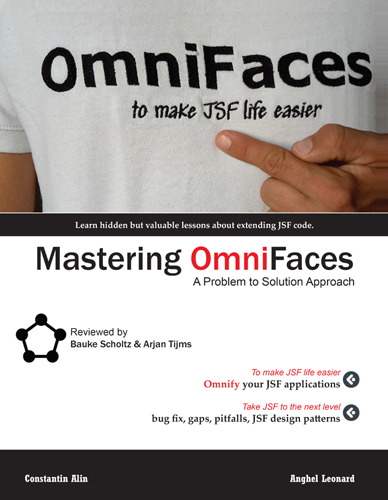 The book Mastering OmniFaces is about my JSF utility library OmniFaces and it was written in cooperation with me. I have reviewed all chapters before the book was published. Written 17033 answers. Active in action, actionlistener, ajax, algorithm, alignment and 544 other tags.